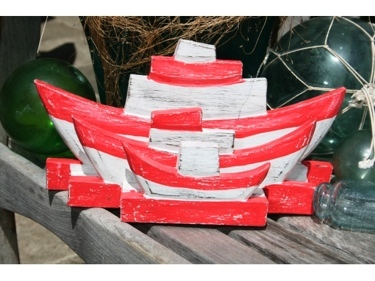 Here is a very charming napkins/letter holder shaped like a sail boat red and white coastal color. Each piece has been hand carved and hand painted with great attention to details. Specifications: - Size: 8 INCHES (20cm) - Type: wood - Color: white and red Perfect nautical art piece for your cottage or beach house. Great nautical decor!